The high seas of Mars may never have existed, according to a new study that looks at two opposite climate scenarios of early Mars and suggests that a cold and icy planet billions of years ago better explains water drainage and erosion features seen on the planet today. For decades, researchers have debated the climate history of Mars and how the planet's early climate led to the many water-carved channels seen today. The idea that 3 to 4 billion years ago Mars was once warm, wet and Earth-like with a northern sea — conditions that could have led to life — is generally more popular than that of a frigid, icy planet where water is locked in ice most of the time and life would be hard put to evolve. The image above shows a young Mars that would have had enough water to cover its entire surface in a liquid layer about 140 m deep, but it is more likely that the liquid would have pooled to form an ocean occupying almost half of Mars’s northern hemisphere, and in some regions reaching depths greater than 1.6 km. (M. Kornmesser / ESO / N. Risinger, skysurvey). To see which early Mars better explains the modern features of the planet, researcher Robin Wordsworth of the Harvard Paulson School of Engineering and Applied Sciences and his colleagues used a 3-dimensional atmospheric circulation model to compare a water cycle on Mars under different scenarios 3 to 4 billion years ago, during what's called the late Noachian and early Hesperian periods. One scenario looked at Mars as a warm and wet planet with an average global temperature of 10 degrees Celsius (50 degrees Fahrenheit) and the other as a cold and icy world with an average global temperature of minus 48 degrees Celsius (minus 54 degrees Fahrenheit). The study's authors found that the cold scenario was more likely to have occurred than the warm scenario, based on what is known about the history of the Sun and the tilt of Mars's axis 3 to 4 billion years ago. The cold model also did a better job explaining the water erosion features that have been left behind on the Martian surface, and which have puzzled and intrigued scientists since they were first discovered by the Viking orbiters in the 1970s. The colder scenario was more straightforward to model, Wordsworth explained, because Mars only gets 43 percent of the solar energy of Earth, and early Mars was lit by a younger Sun believed to have been 25 percent dimmer than it is today. That makes it very likely early Mars was cold and icy, he said. An extreme tilt of the Martian axis would have pointed the planet's poles at the Sun and driven polar ice to the equator, where water drainage and erosion features are seen today. More importantly, under a thicker atmosphere that likely existed under the colder scenario, highland regions at the equator get colder and northern low-lying regions get warmer – the so-called 'icy highlands effect' that is responsible for making the peaks of mountains snow-covered on Earth today. Despite a number of warming factors – including a thicker atmosphere filled with climate-warming carbon dioxide — Mars still would have been quite cold, Wordsworth added. Creating a warm/wet Mars took more work, Wordsworth said. Previous studies have shown that even when the effects of climate-warming clouds, dust and carbon dioxide are taken into account, climate models still don't show early Mars developing any warm and wet periods, he said. But the conditions on early Mars may have been different than scientists' thought, Wordsworth said. 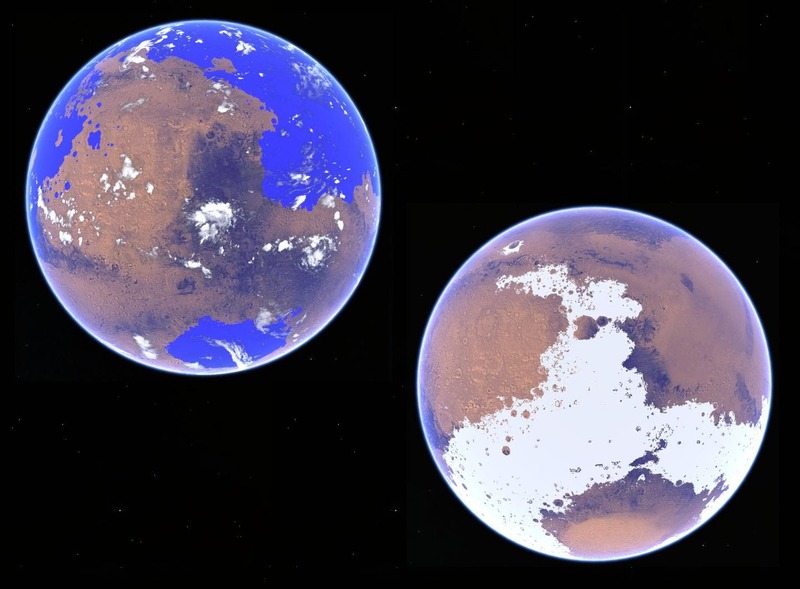 The study's authors added to their model different climate effects to force Mars into a warmer, wet state. 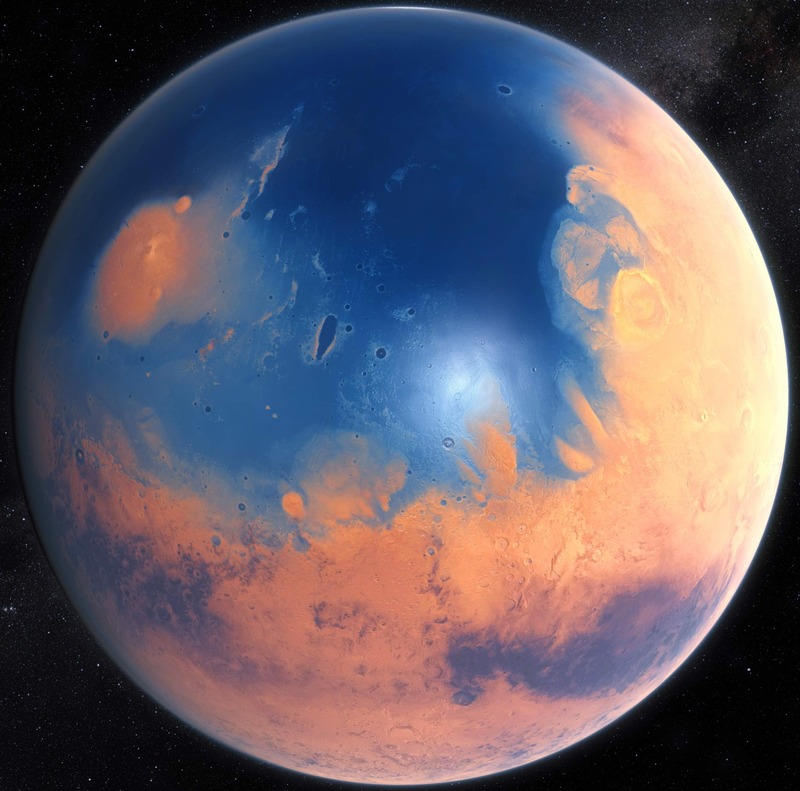 Even then, however, the warm/wet early Mars does not explain the patchwork of Martian water erosion features and valley networks observed on the planet today, and why these features tend to be concentrated near the planet's equator, Wordsworth said. Under the warm/wet model, rainfall rates varied a lot with longitude and latitude. The warm/wet model predicts that on early Mars rain was greatest in an area called Arabia and around the Hellas basin, including in the west and southeast areas of the basin, where few water drainage features are found today. At the same time, several regions with many water-carved valleys, such as Margaritifer Sinus, received one-tenth to one-twentieth as much rain as Arabia and the Hellas basin under the warm/wet scenario. In the warm/wet scenario, mountains also created rain shadows, like those that wring water from clouds to create deserts on Earth. On Mars, the bulge of Tharsis would have caused more rain to fall on the windward western side of the volcanic plateau, where few water features are seen today. To the east, downwind of the bulge, drier air would flow over Margaritifer Sinus, causing less rain to fall there – a situation that doesn't match the drainage features observed there. The cold/icy scenario isn't perfect but it's a better fit to the observations in general, Wordsworth said. While this scenario accumulates frozen water closer to the drainage features observed today on Mars, something had to have melted the ice which carved the valleys, he said. In this scenario, the climate is cool most of the time, and short-lived events like meteor impacts and volcanic eruptions likely caused the necessary melting, he said. "I'm still trying to keep an open mind about this," said Wordsworth. "There is lots of work to be done. But our results show that the cold/icy scenario matches the surface distribution of erosion features more closely. This strongly suggests that early Mars was generally cold, and water was supplied to the highland regions as snow, not as rain." Proving that a cold climate on early Mars led to the features seen on the planet today is a "big question", said Bethany Ehlmann, a planetary scientist at California Institute of Technology and NASA's Jet Propulsion Laboratory in Pasadena, California, who was not involved in the new study. The new paper answers part of that question by showing that locations with snow accumulation in the cold and icy scenario roughly correspond to valley network locations seen today, she said. Further, the model of the cold and icy early Mars shows that some melting of ice would occur, she said. "We know from rover- and orbiter-based data that there were lakes on ancient Mars," she said. "Key questions are: how long did they persist? Were they episodic or persistent? And does the feeder valley network demand rain or is snow and ice melt sufficient?" The 3-D climate modeling used in the new study begins to address these questions with a new level of sophistication by investigating how specific locations might have accumulated rain or snow, she said. Colossal Flare Observed on Closest Red Giant Star –"Impacts the Milky Way's Ecosystem"
Sun-Like G-Dwarf Stars –"Best Bet for Locating Habitable Planets"